Sesa goa is a mid cap stock that many people follow and trade in. As Union Budget 2011-12 proposed raising the export duty on iron ore, the stock was dumped by investors. Here is the stock analysis of Sesa goa post budget. Union Budget 2011-12 has proposed raising the export duty on iron ore to ad valorem 20% on lumps and fines. At present , lumps are taxed at 15% and fines at 5% on ad valorem basis. Sesa Goa generates most of its net sales from iron ore exports (90%). Budget proposal would definitely increase company’s export duty expenses. Comparing this to earlier numbers, esport duty expenses for Sesa Goa would be Rs.1,903cr for FY2012. EBITDA estimates for FY2012 would be at Rs.4,008cr. Sesa Goa’s iron ore sales volume growth is expected to remain at same levels in FY2012. Spot iron ore prices are rising steeply at present due to improved demand from China. It is safer to assume that the rising export duty expenses would be offset by rising iron ore prices. There are a few concerns in medium term like lumpiness in iron ore demand, big swings in the iron ore prices, logistical issues in Goa and stricter regulations being imposed by Indian government to protect country’s natural resources. At current price of Rs. 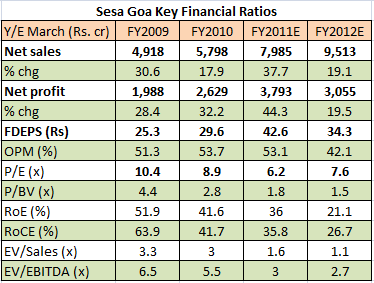 270, Sesa Goa stock trades at 1.8x FY2011 and 1.5x FY2012 estimates on P/BV basis. With estimated EPS of Rs.42 in FY2011 and Rs. 34 in FY 2012, the stock trades at forward P/E of 6.4 and 7.9 for FY11 and 12. If you value it at P/E of 10 which is reasonable, target price could be Rs.300-320 within one year time period. One may buy stocks of Sesa goa at dips for medium term.